It works well for a small office. Great shredder, chews pretty much anything you put in there! You must keep pushing the shredded bits of paper down in the bin quite regularly to avoid it keep stopping, but other than that has been a welcome addition to our office and takes up less room than our last one. Shreds both paper & CDs well. Fine for daily use. However, product was supplied with an inadequate supply of oil, and required a refill after only an hours use! The plastic flap which triggers the bin full light has also broken. Seems very flimsy. Otherwise, the product suits our purposes, and performs well. Not too noisy when used sparingly. We are very happy with the shredder, arrived very quickley. No damage in despatch and working perfectly. Would definately use supplier again. Thank you. Jam Free, Hassle Free, Mess Free! 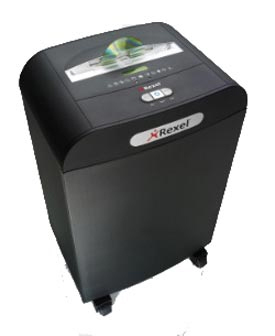 Designed for a shared office of up to 20 users, this departmental Mercury shredder provides sufficient security to shred confidential documents into approx. 200 4x45mm cross cut pieces. It features Jam-Free technology with continuous sensing, takes up to 20 sheets at a time and fits up to 850 shredded sheets in recyclable bags enclosed in a pull-out frame for easy emptying. Cross cut P-3 security level.